Introduced by the University of California at Davis. It is named for the family that brought it from Europe as a seed over 50 years ago. It is reputed to be one of the tallest rosemaries. 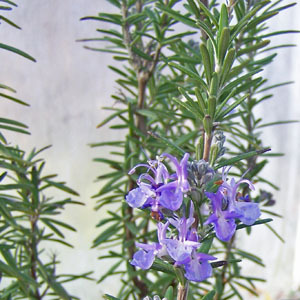 The flowers are bright purplish blue and the leaves are broad and dark green in color. Culinary cultivar. Categories: All Items, all potted plants, butterfly nectar plants, culinary herbs, deer resistant, Potted Plants, More..
At Goodwin Creek Gardens, we grow the plants that we sell. We specialize in herbs, lavenders, scented pelargoniums, everlasting flowers and fragrant plants. We also include a large number of Native American species. We want to emphasize that these native plants are not dug up in the wild, but are all propagated in our nursery. Sign up to receive our email newsletter and offers.